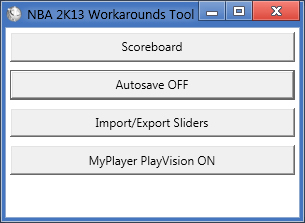 Description: This tool provides workarounds for several issues in NBA 2K13 PC which includes the disappearing scoreboard glitch, Auto-save settings, and PlayVision bug. This will work for now until 2K Sports releases the official NBA 2K13 patch for PC. - Adds the ability to import and export game sliders which is part of the Settings file (.STG), so that you can keep separate sliders files and be able to switch between them easily. - Allows you to view the scores whenever the NBA 2K13 scoreboard disappears in the middle of the game.